For the novice angler getting hold of the right tackle, equipment and bait may seem to be the basic requirements for a successful fishing trip. A lot of man-hours are thus spent on reading through magazines, online detective work and discussions with old pro’s to ascertain the various merits of different rods, reels and artificial lures. Then follows the planning of a fishing trip, location, time etc. Undoubtedly those things are crucial for any fishing trip. To make it a successful trip, however, one must also know how to effectively use one’s equipment in a skilled fashion to be able to grin from ear to ear in a photo displaying that once in a lifetime trophy fish! If someone is new to the angling scene, there is a lot of information to be absorbed before making the first cast and it may seem a bit overwhelmingly at times. However, with experience comes wisdom and even though certain advice may sound odd initially, it will hopefully make sense as fishing times go by. Today I want to share a few thoughts on the three crucial stages of how to reel in a fish. Hopefully, my experience in this regard will prove to be informative to some novice anglers out there. To catch a fish, the angler has to hook it first. To set the hook may differ from species to species and there are a myriad of ways which one can safely embed a hook in the bony mouth of a fish. Most predatory species will attack the bait or lure violently, either from an ambush position or after a high-speed chase. However, there are also times when, say, a big bass or trout will quietly inhale a small lure or fly, testing it for a split second and spitting it out again without the angler even noticing it. Some fish species have hard, bony mouths which require the angler to make sure the hook penetrated the mouth wall by striking a couple of times once the fish has taken the bait. On the other hand, other species have more sensitive mouth organs, and the same tactic may cause a tear in the mouth. If this tear is big enough, the hook may easily disengage during the subsequent fight, especially if the line goes slack for whatever reason. Apart from fishing for sharks, I am not too big a fan of excessive striking after detecting a bite. Firstly, as pointed out, you may lose the fish due to extreme damage to its mouth. Secondly, a fish may pick up your bait without the hook in a good position for a solid hook-up. The moment you strike, however, you may foul hook the fish on the outside of its mouth, mostly in a flimsy piece of skin. One powerful run by the fish is all that is necessary for it to rip the skin loose and a potential personal trophy may escape. Lastly, a fish may pick up the bait for closer inspection and the intention to swallow it eventually. By striking forcefully when detecting any movement at your bait, you may jerk it cleanly out of the fish’s mouth thereby either scaring it in the process of displacing the baited hook to such an extent that the fish loses interest and moves off. Once hooked the next crucial stage is the fight between the angler and his quarry. Again, depending on the species of fish, their fighting styles differ as much as those between individual humans. Some fish species start off actively, but then quickly run out of gas. Others may be reeled in relatively quickly, but once close to shore they suddenly develop a spurt of energy that can catch a novice angler unaware, resulting in a lost fish. Still others can maintain a high level of energy throughout the fight and only give in at the very last. Natural features and obstacles which include underwater gulleys, rocks, boulders and plants as well as manmade structures like concrete/wooden posts of jetties, mooring ropes or discarded junk can all assist fish in their endeavours to avoid capture. More often than not have I hooked into a fish of substance which, one way or the other, beat me in the ensuing battle by making good use of these underwater structures. Over the years I’ve come to realise that there is a reason for the odds being in the fish’s favour especially when the fishing environment is challenging. Firstly, a big fish is a seasoned veteran operating in that specific environment. It has survived lots of attacks by other predatory species over an extended period, experiences which naturally adds to its version of “fish wisdom”. Most fish species are threatened by open water and, once dragged there against their will, they instinctively head for whatever structure is close by. Therefore, during the duration of the fight, it is essential to apply constant pressure on the line by keeping your rod upright and continue reeling in. This is where the drag on your fishing reel comes into play. The drag allows you to keep on reeling during the fight ensuring constant pressure. If the drag is too loose, you have less control over events which will give a strong fish the upper hand in the battle. With a drag set too tight, the fish may make a surprised dash (especially when it’s close to its captor) in which event a fish halve the weight of the breaking strain, can snap the line like a piece of cotton. Watch out for a hooked fish suddenly changing direction and starting swimming directly at you – the risk of a slack line and a lost fish then becomes very real. It is thus of paramount importance that your drag is set at the optimum tension for that specific hook-up for you to dominate the fight. Clearly, a lot depends on the environment you find yourself in. Whether it’s in the ocean or freshwater, you should familiarise yourself, as best as possible, with the various hazards that may come into play and be aware of the specific fighting tactics of your adversary. Each situation must be judged on its own merits, however. Say for instance you fish for bass close to a semi-submerged tree trunk with various side branches sticking out. Here I would advocate for a tighter drag than usual, purely because a big fish, once hooked, will immediately bolt for structure. Although the risk of putting too much strain on the line is high, you have to weigh that up against the real possibility of being wrapped around some timber. As a final thought on the subject of playing a fish, if you notice a fish heading into a direction that spells disaster you can also try and apply some side strain in the opposite direction from where the fish is heading. After successfully playing the fish you enter the final, and also a very crucial, phase. 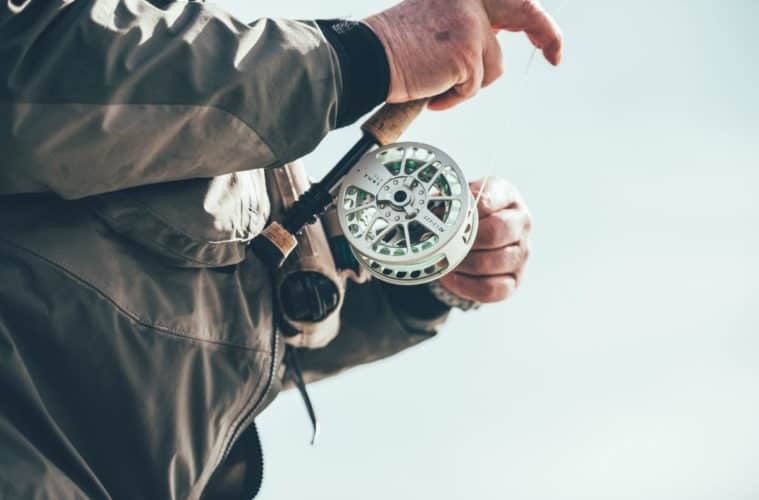 In trying to land a fish successfully, the angler must be extremely careful, especially when fishing in a problematic location like a high cliff, a steep bank or fast running water. A landing net is a big help, but an angler must always apply the golden rule of guiding the fish into the net, not shoving the net towards it. Any sudden movement of the net will spook the fish which may result in a snapped line and a lost fish. Sometimes the fishing location (e.g. rocky outcroppings in the sea) makes it difficult to include a net because the extreme fishing conditions limits the angler to the bare essentials. Here the best tactic is to enter the water and gently grab the exhausted fish while you are standing next to it, or hugging the fish to your body. If you have no landing net available and you are fishing from a beach, allow the waves to carry the fish onto the sand. However, beware of any random bystander volunteering to grab your line during the final stages of the fight to pull the fish on shore. Big mistake! Immediately you lose the flexibility of the rod to counter any sudden movements from the fish. I’ve witnessed anglers losing big fish after a fight of 15 minutes or more after a good Samaritan stepped in to perform (in his view) this act of chivalry. If anybody doubts the veracity of my musings above, do yourself a favour and go and have a peek at some of the funny videos on the internet pertaining to fishing disasters. There are quite a few containing the aspects I’ve outlined here and a number of those are specifically about the loss of a big fish at the very last moment. Having said that, even skilled anglers regularly get things wrong or are just beaten by a wily quarry and that’s why we always go back for more! Johann is a keen outdoors man, an avid fisherman, and native Saffa with a passion for all things wild. His favorite fishing survival tool is the Kershaw knife. Why Do Fish Jump Out of the Water? Go Get a Fish is a participant in the Amazon Services LLC Associates Program, an affiliate advertising program designed to provide a means for sites to earn advertising fees by advertising and linking to Amazon.com.